Using rel=canonicals on webpages has been the default standard for referencing canonicals. But for larger sites, some have been utilizing sitemaps for showing Google their canonicals. Google has updated their help page on canonicals and it now includes information on how it views canonicals in different formats. Most notably, Google now states officially that canonicals in sitemaps is considered a “less powerful signal” than using rel=canonical. Why would this be considered a weaker signal compared to using rel=canonical? Many sitemap generators used by websites by default include every URL on the site in those sitemap, even pages that have their own rel=canonical references. So while this could be a valid signal for some sites, this fact so many sites include both the canonical and non-canonical URLs in their sitemaps means that this isn’t a reliable method for those. And some site owners don’t even realize that sitemaps could have an influence on their canonicals. 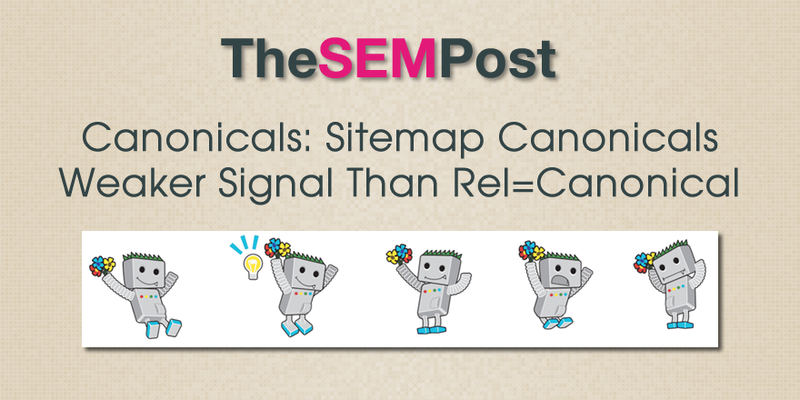 Also throwing confusion for using sitemap canonicals as a signal, some sites don’t keep their sitemaps updated as often as their sites, meaning it could also be outdated for canonical purposes. Lastly, even if sitemap canonicals are done properly, the sitemap should only reference the canonical page, meaning it would still be up to Google to determine which of the duplicate or near-duplicate pages should be the ones associated with each canonical in the sitemap, and this isn’t always perfect. This is something that many SEOs would prefer to direct to Google themselves using rel=canonical rather than letting Google be the ones to decide which pages are mapped to which canonical. If you are needing to use canonicals to specify to Google which page should be indexed, you should still be using rel=canonical as your go to canonical usage. I wonder if we can assume the same for hreflang and rel=alternate (mobile) in sitemaps, too?